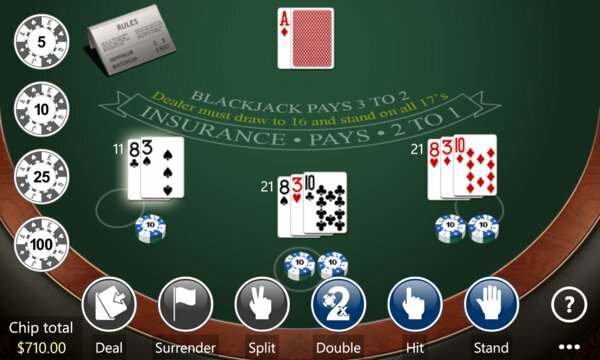 Blackjack Assassin is the ultimate blackjack experience for Windows Phone. Tap the betting chips to place a bet, then tap deal and you're on your way. Hit, stand, double down, split on a pair, or surrender--the decision is yours. Customize your casino experience by setting the table rules under Options. Choose the number of decks, when you can double down, whether the dealer hits on soft 17s, whether you can surrender and more. Need a hand with your hand? The odds are already in the house's favor; don't give them a bigger edge by making poor decisions. Learn basic blackjack strategy by playing Blackjack Assassin, where the strategy adjusts to the rules of the table. Don't visit the casino without learning basic strategy here first. 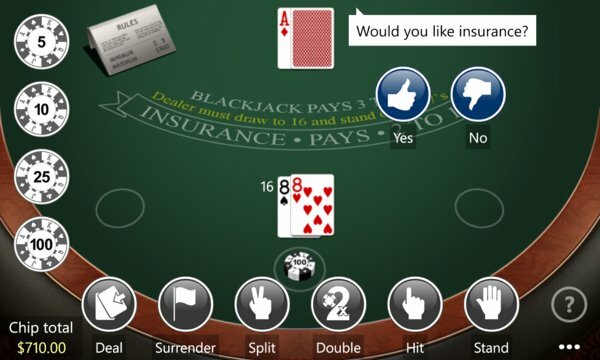 Blackjack pays 3:2 and insurance is offered if the dealer's up card is an ace. The trial version is fully functional but ad supported. Upgrade to play without ads.